The tradition dates back to 1984 and serves to honor the link between Greece and Boston, the city dubbed the "Athens of America". The event, which will be hosted along with the non-profit organization Alpha Omega Council, will be held in the Great Hall of the Massachusetts State House. 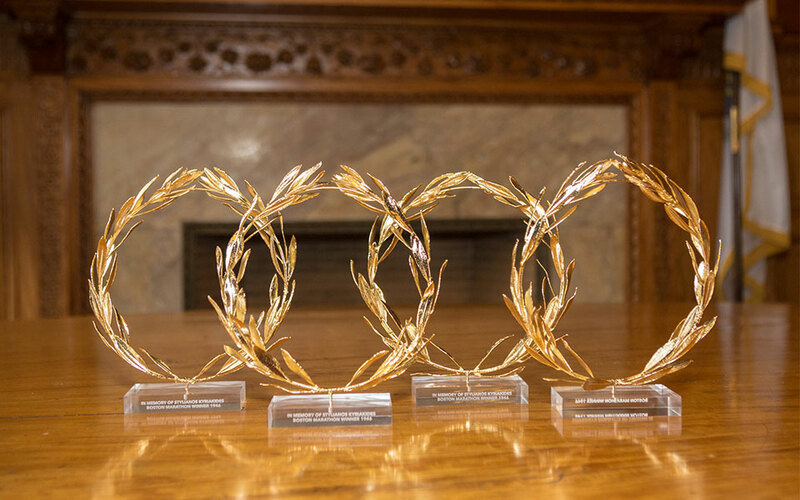 Since 1984, the Consulate has gifted real Greek olive wreaths, cut from Marathon, and gilded in gold, to crown the race winners, as a way of transmitting Classical Greece’s tradition to Boston, dubbed the “Athens of America”. “These wreaths connect Boston and Greece with the Boston Marathon and the ideals of democracy and liberty, “says Efthymiou. The Wreath Ceremony will also recognize 12 local student essayists chosen out of nearly 1,000 students from Ashland Middle School, Hopkinton Middle School, Boston Latin Academy, and O’Bryant School of Science & Math in Boston. The students are the winners of an essay contest on the historical significance of the Battle of Marathon. The evening will also honor WBZ-TV 4 CBS Boston for its 35 years of ongoing dedication to covering the Boston Marathon and its role in our community.